Looking for a smarter, more customizable solution for your pool liner installation? Vinyl pool liners have risen to today’s design challenges, offering homeowners custom pool liners with ease of maintenance, flexible durability, and nearly limitless shapes and sizes. It’s probably time you pursed vinyl inground pool designs, too. One of the most popular and timeless options, the vinyl liner pool isn’t going anywhere anytime soon. With the lowest initial cost of inground pools, vinyl pool liners are customizable in shape and size, with no limits on depth, length or width. What’s more, the material is nonabrasive, smooth to the touch and relatively nonporous, so it inhibits algae growth. By harnessing vinyl, pool liner installation and replacement experts can build you an outdoor escape that provides years of relaxation and comfort. Let’s delve into the benefits a little deeper (pun slightly intended!). When you decide to invest in a pool, you want to swim in it as soon as possible. 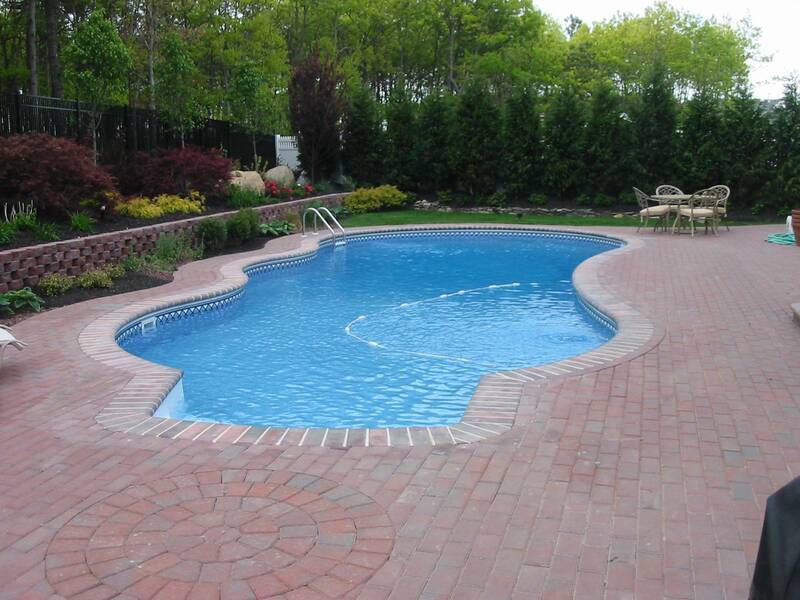 A vinyl pool liner installation comes with predictability, giving you a concrete start and finish time. Most other materials used for inground pool liner replacement or installation can be hindered by weather, pool size, and landscape environment. Custom pool liners like vinyl offer a wide range of shapes and colors, making it a smarter product that’s easy to update often. Just like you wallpaper your dining room on a whim as your tastes change, vinyl pool liners offer the same flexibility. Like a tile pattern? Your professional pool company likely have a product that allows for custom tile along the waterline and the liner installed underwater. Vinyl also complements a variety of water features like rock slides, waterfalls, lighting, and more. But perhaps its best benefit is its ability to deter algae and dirt buildup. The smooth surface makes maintenance a synch, it will never scrape your skin when you brush against it. Unlike gunite and concrete pools, which a more climate-dependent, a vinyl pool liner installation is also very forgiving structure, easily maintaining high quality regardless of the elements. Give it the proper care and maintenance every pool deserves, and you can enjoy your vinyl liner for up to 20 years. The quality of vinyl pool liners continues to be touted by the pool industry, with many designs winning awards and people actually mistaking them for gunite and ceramic tile! Considering they’re much more affordable, how can you not want to consider it for an inground pool liner replacement or installation. Vinyl-liner pools offer unbeatable customization—essentially if you can imagine it, a professional pool builder can bring it to life. If you want a luxury pool, you have nothing to lose—and actually, money to save—by going with a vinyl pool. With this super-flexible material, pool experts can create a stunning pool environment, that provides superior quality and enjoyment. If you want a pool built with form and function in mind, vinyl designs offer the relaxing escape you want—in your own backyard.